December 15, 2017 December 13, 2017 by Beau H.
As each week flies by in December, I’m … well, a bit stunned at how quickly time is passing! Wouldn’t you agree? It’s certainly the holiday season in full force here in Brooklyn & NYC, from the lovely Bryant Park Holiday Market to cool decor all lit up around downtown Brooklyn. Are you excited yet?! I sure am. What’s on your holiday style wish list? Hopefully, some great winter gear. 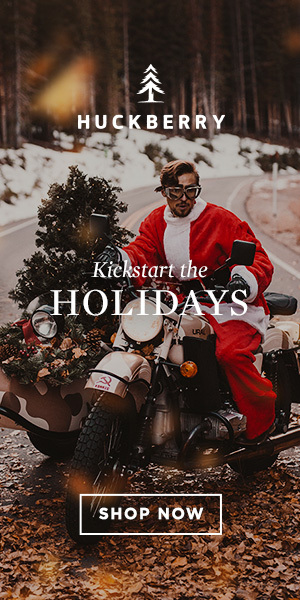 If you haven’t done so already, you can certainly take care of your men’s gift guide shopping, and your women’s gift guide shopping, while you’re perusing the pages of this site! I’m looking forward to a relaxing weekend after capping off a busy week — I trekked to Toronto this past weekend to see my favorite band, The National, and loved checking out the city’s craft beer scene and fine shopping (Filson & Frank and Oak were among my stops!). Earlier in the week, we also talked about how to dress for holiday travel, so I hope you keep those tips in mind in the coming weeks. As for me, I’m taking a bit of a trip of my own –I initially meant to take this trip in November, but as it were, I’m heading upstate to the lovely town of Beacon and the famed Dia: Beacon museum for a day trip. Be sure to follow along on Instagramfor more on that. For now, it’s high time we closed out this week — onto the best #menswear news and notes! Cheers! The holidays are filled with tricky dressing situations aplenty, seemingly around every corner. Let’s say you’re traveling to meet your significant other’s parents for the first time (yikes!) this season. Let’s make a great impression, yes? How can you do that? By dressing the part, of course. And that’s where Stitch Fix comes in. If you follow me on Instagram you might be familiar with the brand’s model, which I’ve tested out this past season. In short, a personal stylist provides you with a box packed full of stylish menswear, from layering pieces to shirting and pants, all geared to fit your personal taste (all you need to do is sign up and provide some background info on your style — which I have no doubt is impeccable). You pay for what you keep, and you return the rest for free. It’s like getting a custom outfit picked out for you by a stylish psychic, nearly. Holiday dressing is solved, I’d wager. Know a guy who loves to hit the slopes — in style, of course? If you’re not familiar with Aztech Mountain — a function and fashion-minded brand featuring the input of alpine legend Bode Miller on the brand’s team — then you’d best update yourself now. The brand’s Loge Peak Ski Shirt is handsome, refined and technically savvy, all in one; it’s the perfect splurge gift for the guy who has everything. Code of Bell is wrapping up the last few weeks of a Kickstarter campaign geared toward minimal, functional pieces for your everyday carry, including a line of travel-ready packs that you would certainly do well to check out in advance of the brand’s Spring 2018 product shipment. Read more at the brand’s site, folks. OK, that’s all the news and notes I’ve got for you this week — enjoy the weekend, and look for our Style Pick of the Week tomorrow!